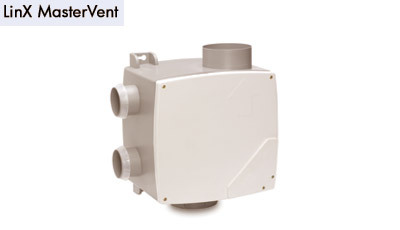 The MasterVent is a wholehouse ventilation system incorporating features designed to make installation and commissioning simpler and cost effective. It is suitable for simultaneous ventilation of separate wet areas in a house or flat gathering wet polluted air and discharging it to atmosphere. Each intake spigot of the unit incorporates an auto air volume regulator which controls the volume and pressure within the ducts, regardless of the duct lengths. This automatic feature ensures commissioning is much quicker. The unit has 3 integral speed settings and an overrun timer.